The lightweight, wearable Vocera Communications Badge. Nurses use the Vocera Communication System to speak with other clinicians while tending to patients. Alarm management and notification remains one of the most important patient safety concerns for healthcare providers. Professional and media focus on patient safety has increased over the past few years with landmark reports from the Institute of Medicine (IOM, 2000; IOM, 2004b; AHRQ, 2001), new patient safety standards from the Joint Commission on Accreditation of Healthcare Organizations, and the creation of advocacy groups like The Leapfrog Group for Patient Safety. Much of the patient safety focus, and progress, has been on adverse events resulting from medication administration errors. Groups like the American College of Clinical Engineers have dedicated significant efforts towards improving the impact of clinical alarms on patient safety (ACCE Health Technology Foundation, 2006). Many challenges around caregiver vigilance and failure to rescue remain. Failure to rescue occurs when changes in the health status of the patient are not detected, resulting in a patient death or necessitating rescue activities by the healthcare team (IOM, 2004a). A study in 2004 found the risk-adjusted rate for failure to rescue in U.S. hospitals to be 1,511 per 10,000 admissions (MedPAC, 2004). Patients connected to medical devices  typically patient monitors, infusion pumps, and ventilators  were once confined mostly to surgery and critical care nursing units. Critical care unit overcrowding from inappropriate admissions (Gautney, et al., 2004) and an aging population (Strunk, et al., 2006) have resulted in concepts like universal beds and variable acuity units. These growing trends place higher acuity patients in units outside of critical care, where nurse-to-patient ratios can be 1 to 4 or higher. The patient care environment and vigilance provided by medical device alarms are essential for patient safety in any nursing unit and, especially, variable acuity units. At the point of care, patients are served by multiple medical devices, performing a myriad of tasks  from surveillance to the delivery of therapy. Each device has its own alarm parameters, alarm categories, and methods of annunciation. When different devices come together at the point of care, the environment can become a cacophony of bells, buzzes, chirps, and flashing lights coming from central stations and patient rooms throughout the unit. Communications and interruptions in the delivery of care also impact patient safety. Besides providing direct care, caregivers must also coordinate the delivery of care by others, communicate with attending and consulting physicians, facilitate transports outside the unit for diagnostic tests or therapies, manage visits from respiratory therapy and the collection of specimens, and coordinate with social workers and discharge planners. Added to these activities are interruptions via nurse call, phones, overhead pages, and medical devices. "There can be so many alarms at a given time that the patient care environment becomes dysfunctional," says William Hyman, professor of biomedical engineering, Department of Biomedical Engineering, Texas A&M University. "This is a well known occurrence where alarms can become un-responded to, becoming part of the background noise. When environments become excessively noisy, it can become so unbearable that users have been known to sabotage alarms." Vendor standardization is a common strategy to improve the care delivery environment. But standardization has its limits; hospitals must still use products from multiple vendors across device categories. "Even vendor standardization has limited benefit," says Hyman, "because many product lines were acquired or designed independently, and while all are branded alike, the products are still different and use different schemes for alarm annunciation. The use of many different devices and vendors results in too many different alarms and alarm types for users to manage." Managing the care delivery environment is difficult. According to Brian McAlpine, director of marketing for Emergin, "alarm fatigue is one of the biggest issues for hospitals today. The more we discuss alarm management with a hospital, the more they realize they don't know the frequency or types of interruptions that break into a caregiver's day that must be managed appropriately to ensure patient safety." Hospitals are working to improve care delivery environments, investing in better communications systems, replacing desk phones and overhead pages with nurse-carried wireless phones and communicators. False positive nuisance alarms are major contributors to alarm fatigue. Some patients generate frequent false positive alarms. This patient problem propagates because it degrades the environment. If a patient is taking too much attention, that distracts staff from other important tasks on the unit. Alarm fatigue is not just the result of false positive alarms. Alarms must be directed to the responsible and available caregiver, without distracting everyone else on the unit. And systemic changes in a patient's condition must be recognized and managed so that the same physiological change does not trigger duplicate alarms in the different devices connected to the patient. According to healthcare information technology veteran Charles Fox, "Using connectivity between medical devices and clinical information systems, we can be smart enough to let the clinician know what to focus on and what not to focus on; we need to help clinicians focus on the clinically significant data." Alarms must be truly actionable to improve patient safety. The integration required for this goes beyond a single parameter and its normal values and must evaluate parameters within the context of other parameters derived from other devices and data from information systems. This broader context results in patient-specific normal parameters that change over time. Traditional threshold alarm limits generate many false positive alarms of little clinical value. Adding decision support and specificity is critical to reducing false positive alarms. Cardiopulmonary Corporation provides a glimpse into the future of alarm notification. They manufacture a surveillance and alarm notification system called Bernoulli Enterprise. Initially developed for ventilators, the system integrates with additional devices like patient monitors and SpO2 monitors. Cardiopulmonary's system supports multiple vendors in a single implementation because most hospitals use ventilators from multiple vendors. Human factors engineering necessitated the normalization of alarms across vendors, to the extent of generating alarms in their system that are absent on some ventilators. According to Jim Biondi, MD, chair and CEO of Cardiopulmonary Corporation, "Getting time-sensitive data with specificity to the right care giver is important to patient care. Once you get the device data back to a server, there is an opportunity to bring in clinical decision support to complement the alarm." This decision support looks at data from multiple devices, considers latency, duration of events, and frequency, increasing the clinical value of alarms. Ventilator disconnect alarms are corroborated by a low oxygen saturation value from a separate device; the synthesis of these alarms provides more value that either alarm on their own. The advent of FDA-regulated connectivity to multiple disparate devices has been pioneered by Cardiopulmonary. The system combines real-time physiological data with historical data from clinical information systems. The non-device data is organized in profiles for cardiovascular, renal, respiratory, and fluid balance. Decision support is site specific based on the hospital's requirements, practice patterns, and patient population. Providers outline key clinical clusters or problem categories. The resulting decision support and alarming evaluates patients over time to identify clinically significant changes providing earlier and more effective interventions. "Clinical rules are developed to drive specific responses to specific data inputs," says Biondi. "This is a fundamental IT-centric shift where an application reacts continuously to physiological data in conjunction with medical devices and clinical information systems." The wildly heterogeneous environment in hospitals, especially at the point of care, has given rise to a unifying solution. Emergin Incorporated delivers alarms to caregivers, supporting and optimizing workflow, and providing the tools to measure and report on key performance indicators. Their middleware system processes, filters, and communicates messages and events to the appropriate person. 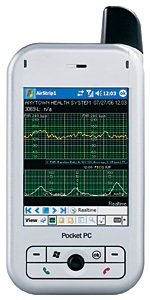 A typical Emergin installation receives data from nurse call systems, medical devices, and information systems; using nurse to patient assignment and patient to device association data, the messages are conveyed to individual's communications devices. The system also includes a "flight recorder" that logs events and activities managed by the system. This log is used to generate dashboard views of operational and event data used in Failure Mode Effects Analysis of adverse and sentinel events. Fetal monitoring waveform from GE's Centricity Perinatal displayed on a PDA using AirStrip OB. Developed by MP4 Solutions under an exclusive licensing agreement with GE Healthcare, AirStrip OB allows obstetricians to view near real-time waveforms and other key data anywhere a cell phone connection is available. Both systems are 510(k) cleared. Improved communications (including alarms) can provide immediate improvements to the point-of-care environment. "There is high demand for using devices like SpectraLink, Cisco, or Vocera communicators for alerts and alarms," says McAlpine. "Hospitals that have not adopted wireless phones are using pagers, but clearly two-way communications is the long term solution offering the highest level of patient safety." Besides medical device and nurse call alarms, Emergin sees growing demand for Critical Test Results Management (CTRM) notification. Anything that interrupts the clinician is not necessarily good; they can be life-critical alarms, annoyances, or something that can wait. Depending on the task at hand, like programming an infusion pump, this can greatly impact patient safety. The better those interruptions are managed, the safer the environment. According to McAlpine, "Emergin is giving focus to a broader event-driven environment that must be managed by the clinician." Most hospitals lack key performance indicators for measuring the point of care environment because a vast amount of data would have to be manually compiled. The Emergin platform captures the events that can answer questions like how many life critical alarms or events a caregiver can receive and effectively manage in a given period of time. A limitation of some stand-alone medical devices is the reliance on fixed alarm limits. "One size fits all" alarm limits contribute to false positive alarms. Error resistant systems would create an envelope of parameters and therapy responses based on the individual patient and their changing conditions over time. "Sophisticated algorithms to determine what is normal for a specific patient would reduce false-positive alarms," says Fox. Such sophisticated algorithms must still be designed and validated. Ultimately clinicians need error resistant systems where devices respond automatically to changes in the patient's condition. For example, during dopamine therapy infusion, blood pressure and heart rate data from one device would be used to adjust therapy on another device, and notify clinicians as needed. "Alarm management is evolving into a clinical management tool," says Biondi. As more patient data becomes available, the management of that data will support earlier clinical interventions, more effective alarms, and better patient outcomes. The real value in the digitalization of the hospital lies in better patient clinical management, safety, and triage. Most current systems are not real time. They collect data in real time, but don't do anything with it until they're asked for it. In a typical use case, data acquired from medical devices goes to a queue that waits for a clinician to validate the data before it's pushed into the chart. The challenge is to move some part of the system from off-line to real time. This level of interoperable connectivity requires cooperation between vendors. But medical device vendors want to control the mechanisms and alerts associated with their devices to create end-to-end proprietary solutions. And healthcare IT vendors want to extend their products into point-of-care systems currently provided by device vendors. Getting direct competitors or even potential competitors to work together has been difficult. So far, only a few third parties like Cardiopulmonary and Emergin have been able to extract the necessary cooperation to realize truly innovative products. Without pressure from the market, common business concerns will keep device and healthcare IT vendors from collaborating on solutions that could help solve persistent alarm notification problems. While vendors slowly develop better technical solutions, what is the role of providers? "Healthcare providers have been poor technology consumers," says Hyman, "they don't insist on getting what they need from vendors, they continue to buy products that (at least in part) don't meet their needs, and 'make do' with what they can get." Hyman observes that vendors meet market demands, and that providers must get more demanding with regard to patient and caregiver centric solutions for the point of care. Providers should identify gaps in current alarm notification systems and draft requirements for future purchases. "Unfortunately, not many hospitals have the resources to do this effectively," says Hyman, "and tend to rely too much on rosy vendor characterizations." This process can be done by individual providers, as a collaborative effort among providers, with a consultant, or with vendors. Fox observes, "Medical device vendors are device centric in their view of the point of care; providers are patient centric, and healthcare IT vendors are caregiver centric." Meaningful improvements in patient safety at the point of care require that alarms become more clinically significant, and are presented to caregivers more effectively. While single vendor solutions have a strong appeal with healthcare organizations, it is time to look beyond an individual vendor's perspective  no matter how big the vendor  and consider solutions from a patient perspective. Multi-vendor solutions will complicate the needs assessment and vendor selection process if only because so much happens at the point of care. A patient-centric approach is required to deliver patient safety improvements. Once a comprehensive needs assessment is completed, portions of your solution will come from multiple vendors. Hyman suggests the following process for evaluating vendor solutions. Have the vendor describe the problem, describe the solution, and then show how their product addresses that problem. Be sure to identify any new processes, tasks or outcomes that are introduced by the solution. Also, require specificity in the evaluation of potential solutions  dig deep into general descriptions and demand detailed assessments. Finally, determine how to measure the impact of the solution on problems that are to be solved. For many providers, the easy alarm improvements have been made. Further patient safety improvements require providers to cross traditional product boundaries and demand patient and caregiver-centric solutions. Tim Gee is principle of Medical Connectivity Consulting in Beaverton, Oregon. During more than 20 years in healthcare, he has pursued a career in hospital connectivity. Starting in cardiology, the ICU, and radiology in early 1980s, he created products to automate workflow for cardiology, the emergency department, most patient care areas (ICU, telemetry, step down, labor & delivery, and general care areas), and radiology (both RIS and PACS). Through it all, Gee gained an expertise in workflow throughout the hospital, required technologies, and enterprise applications. He is a member of HIMSS and HIMSS Medical Device Security Workgroup, AAMI GMP/QS Requirements and Industry Practice certified, September 2004. Gee maintains a blog at www.medicalconnectivity.com and may be contacted at tim@medicalconnectivity.com. Agency for Healthcare Research and Quality (AHRQ). (2001). Making health care safer: A critical analysis of patient safety practices. Evidence Report/Technology Assessment: Number 43. Available at www.ahrq.gov/clinic/ptsafety/pdf/ptsafety.pdf. Gautney, L. J., Stanton, M. P., Crowe, C. & Zilkie, T. M. (2004). The emergency department case manager: Effect on selected outcomes. Lippincott's Case Management, 9(3), 121-129. Institute of Medicine (IOM). (2000). To err is human: Building a safer health system. L. T. Kohn, J. M. Corrigan, & M. S. Donaldson (Eds.) Washington, DC: National Academy Press. Institute of Medicine (IOM). (2004a). Keeping patients safe: Transforming the work environment of nurses. A. Page (Ed.) Washington, DC: National Academy Press. page 171. Institute of Medicine (IOM). (2004b). Patient safety: Achieving a new standard for care. P. Aspden, J. M. Corrigan, J. Wolcott, & S. M. Erickson, (Eds.) Washington, DC: National Academy Press. MedPAC. (2004, March). Report to Congress: Medicare Payment Policy, Chapter 2; Quality of Care for Medicare Beneficiaries. Strunk, B. C., Ginsburg, P. B., & Banker, M. I. (2006). The effect of population aging on future hospital demand. Health Affairs, 25(3), w141-w149. ©2007 by Lionheart Publishing, Inc.